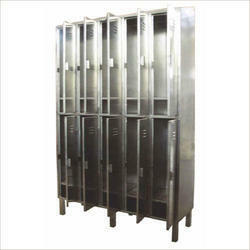 Our wide range of SS Apron Cabinet is fabricated from quality raw material such as SS 304. 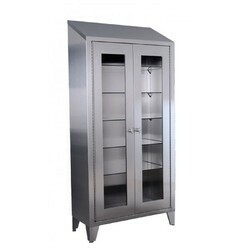 These apron cabinets are available with shoe rack in various sizes as per the clients’ specific requirements. Our range is renowned for features like corrosion resistance and longer working life. - SS apron cabinet with glass 16 swg body, 304 quality, 18 swg partition as per your design 320 grade finish as per your design. Our company is one of the leading companies that manufacture, supply and distribute an extensive range of SS Apron Cabinets. These products are extremely robust in nature and ensure longer functional life. All these products are well known for their attributes like dimensional accuracy, optimum strength and perfect finishing. Outer Dimension: -1350Hx 600W x 300D mm .